The Samsung Galaxy Mini 2 is an upgrade to the original Galaxy Mini. Billed as a compact Android smartphone, the Galaxy Mini 2 isn't really "mini" at all and it makes a rather pointless addition to Samsung's smartphone range. This phone is slightly better specified than the entry-level Samsung Galaxy Y, with a 3.27" 320 x 480 pixel display, a 3 megapixel camera, an 800 MHz processor with 512MB of RAM, a useful 4GB of internal flash memory (plus a microSD slot) and all the other features you would expect to find in an Android 2.3 smartphone such as 3.5G support, WiFi and GPS. It isn't really a small phone, measuring around 109 x 59 x 12mm, although it is quite lightweight at between 105 and 107 grams depending on whether or not it comes with the optional NFC module. It's quite an attractive handset to look at, which should certainly appeal to younger customers, who are also targeted by the Galaxy Y. The currently Galaxy Mini retails for about €120 SIM-free, and we would expect the Galaxy Mini 2 to cost around the same when it hits the market. 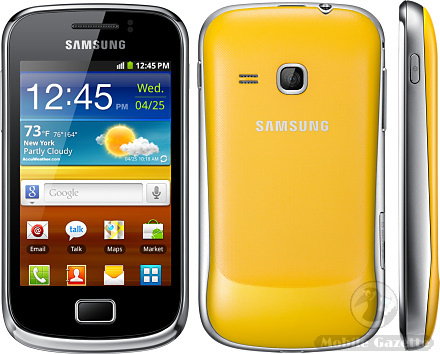 Samsung say that the Galaxy Mini 2 should be available from March 2012 in France followed by other countries after that.